This season, awaken your senses with the fresh, fruity notes of Azure Breeze: the perfect scent for summer. 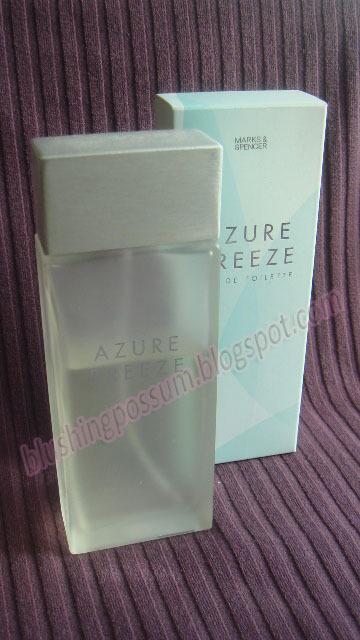 Marks & Spencer’s Azure Breeze holds a very universal scent. It’s a beautiful and clean summer perfume which I find incredibly easy on the nose. This will totally appeal to citrus lovers because of its delicious lemon notes. I’ve heard a lot of people say that this little darling smells like Light Blue by D&G and I Love Love by Moschino. My partner used to own the former and I kind of agree that they do have similarities but I must say that Azure Breeze has a distinct smell of its own. It gives fresh, fruity finish while Light Blue is musky and a little powdery – at least from what I can smell. I really can’t make a comparison with I Love Love since I haven’t had a smell of that yet. I’m not the type of person who is very into perfumes because most of them makes me nauseous and gives me headache. Fortunately, this one doesn’t! The scent is very light and non invasive. It has become my go-to fragrance since I got this last summer. The lasting power is great since I only need to spray this once during the day. If you’re looking for a fresh and neat whiff without breaking your bank (see retail price below product description), then this is a total must try.